As some of you know already, a couple days ago I started streaming live from the server every other day. The stream schedule may change in the future, but for now I’ll do my best to make it 4 hours every other day, 4 days a week. The best way to be notified when I go live is to click on the link above, and then the follow button. It doesn’t cost anything and you’ll receive a notification by email each time I go live. Now, on to the second announcement. Following development of a new 1.7.2 server with all the new items, biomes and game mechanics, this week only I’ve opened a survival test server for your enjoyment and testing. Important: This is a test server. The survival 1.7.2 server will close this weekend, so don’t get too attached to anything you build there. The map itself will be available for download so you can continue where you left off, on your own PC. The purpose of this server is to mainly find bugs, so I can fix them before applying the update to the skyblock server. Given it is a temporary server meant for testing, you can ask me for items and if I’m around I’ll give them to you. 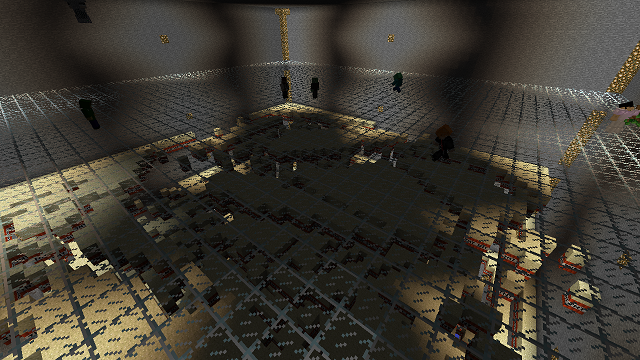 Keepinventory is ON in overworld. It’s OFF in the nether and End. 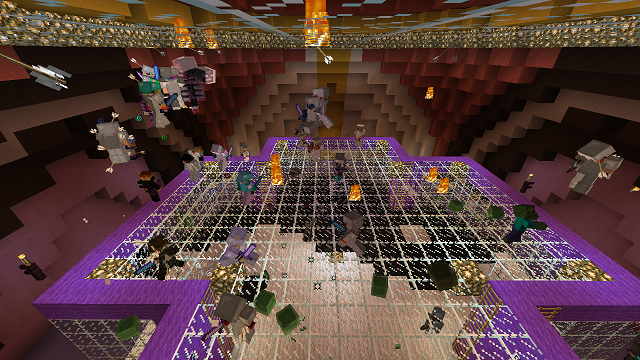 MobGriefing is OFF in overworld and nether. Given the server is only temporary, and I often spawn items for everyone, and you can get any of the donation ranks by simply asking for it, hence more free items I feel there’s really no need to grief or steal from other players. If you do so, you might find your privileges to play on this survival server revoked. Really, this is only meant for fun, and to find any bugs. Try and be nice to everyone else, will ya? Oh, and if you find any bugs let me know please so I can fix them. This entry was posted in Minecraft Skyblock Server News, Minecraft Survival Games News on December 3, 2013 by heatseeker0. If you win you can pick any combination of items and upgrades to be applied to your account from the Buycraft real money shop. The total value of the items and upgrades you pick must be at most the value of the prize you won. Click on Account Upgrades and Item Packs to see what are the available items and upgrades. To buy a ticket for the raffle, do /raffle in game and follow the instructions. Anyone can enter the raffle. A ticket costs 50 sc. To keep it fair for everyone there is a limit of 1 ticket per in-game account. You don’t have to remember your ticket number, the plugin handles this automatically for you. You don’t have to be in-game to claim your prize. After the event I’m going to post the winners on the website, and if for any reason you cannot be in game at the time of the draw you can contact me in the next days to claim your prize. I’ll try to record the event on video and post it later on the website. No promises though, depends if I can get it working by then. If not, there will be plenty of screenshots. P.S. : There will be other unannounced prizes and contests before the main raffle will take place. See you all in game! This entry was posted in Minecraft Skyblock Server News, Minecraft Survival Games News on November 23, 2013 by heatseeker0. Enjoy, and don’t forget to check back later for details regarding the raffle with prizes from the real money shop we’re holding this Sunday. The party goes on! Yesterday TNT Run minigame was launched. In case you missed it, to join type /tr join default, and to spectate a running match do /warp TNTRun. No spoilers, so you’ll have to log in to check what’s in the bag. All I’ll say is this: one of the items inside is completely new to the server. Nobody had it before, and there was no way to get it. Another item was available a while ago, and then ran out. There will be another anniversary kit, it will become active Thursday. Default arena join time increased from 10 to 30 seconds. Battle length increased from 3 to 4 minutes. This entry was posted in Minecraft Skyblock Server News, Minecraft Survival Games News on November 20, 2013 by heatseeker0.